I’m going to attempt to walk 100 miles without sleep. It’s crazy, it’s extremely difficult, and it’s very likely I won’t be able to do it, but that’s kind of the point. I want to see what it’s like and I want to see how my body will respond. I want the experience, and if I manage to somehow succeed I can say I’ve done something that very few people have. I’ve been planning this for close to a month. I will be walking predominantly on the W&OD trail in northern Virginia, which is about 45 miles long and passes close to my parents’ house. I have a schedule that includes six stops that total 5.5 hours of rest for food, water, restrooms, and phone charging. I plan on leaving at 2 PM and returning at 5 AM two days later. If I’m unable to continue, I’ll call for someone to pick me up. Throughout the entire walk, I’ll be tweeting updates about my progress and condition from @sangaman. The last (and only) time I tried an endurance feat was the Charlottesville ten miler in 2008. I wrote an article about it for the school paper here. It was a last minute decision, I hardly trained at all, and I used basketball shoes since I didn’t own any running shoes. My knee started hurting very badly for the last mile or so which slowed me down, but I managed to finish at about an 8:45/mile pace. The thrill of finishing was incredible; easily worth the pain. My stamina now isn’t as good as it was then. I play basketball about once a week these days, but I don’t get as much exercise as I’d like. Regardless, one thing that’s in my favor is I love walking. Whenever I’m walking long distances, I feel like I can walk forever. However, feeling like I can walk forever is not the same as actually doing it, so I’ve been preparing. I’ve done some running/walking for medium distances to get myself ready and to break in a new pair of walking shoes. I’ve done a lot of research on ways I can avoid common pitfalls such as dehydration, injury, blistering, and chafing. To stave off boredom (and possibly sleepiness) I’ll listen to audiobooks on my phone, starting with The Long Walk. When I first got this idea, I sent off e-mails to a bunch of companies who sell energy/endurance/athletic products asking if they would sponsor my walk by sending me a bit of merchandise. Almost all of them turned me down, but the one company that was generous enough to accept my request was 5-hour Energy. I’ve never actually used their product before, and in my experience I’m immune to the energizing affects of caffeine, but this might be crucial when I’ve been awake for over 24 hours. Regardless, I really appreciate the generosity and goodwill, especially considering how many companies turned me down or ignored me. I’m also trying to raise some money for charity, so that I’ll know that some good will come out of this attempt even if I don’t make it. I chose the Arlington Food Assistance Center, which helps feed low income families in Arlington, VA. I chose them because they are local and because they get high marks for transparency and efficiency from Charity Navigator. Donations of any amounts would be greatly appreciated and a motivating factor for me. If you want to donate $10 or more and get a receipt for tax deduction purposes, you can donate on their website. Send me a line if you do this so I can keep track. If you want to donate a smaller amount, you can send me money on PayPal at ‘mcnallydp at gmail dot com’ and I will donate on your behalf. If the weather in VA is projected to be dry and mild this weekend, I’ll probably start this walk on 4/20. If the weather is bad or if something comes up, I’ll attempt the walk on one of the next two weekends. I definitely want to do this before it gets too hot. I’ll be updating this post when I know the starting date for sure. Wish me luck! 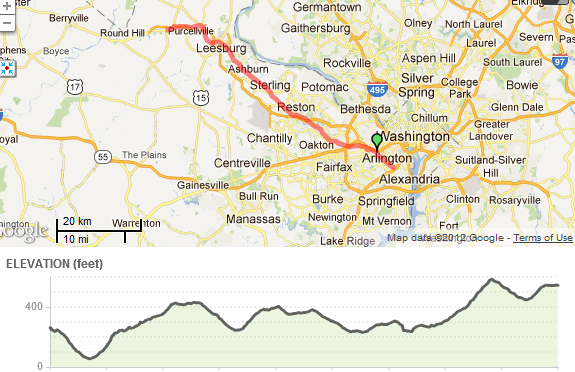 Update: I’m starting this walk around Noon on Friday 4/20/12. Hello. Welcome to my first ever attempt at a blog. Back in college, I used to write every other week for the Life section of the Cavalier Daily. I’d write about different topics for each article. My objective was simply to make my articles entertaining and amusing for the average college student. I enjoyed that a lot, and that’s sort of what I’m going for here except with a slightly nerdier and more personally meaningful focus. My posts will be about anything that I find interesting or thought-provoking and will likely include topics such as poker, politics, psychology, and sports (specifically basketball, specifically college basketball, specifically Kentucky basketball). I don’t want this to be a diary or a profile of myself, but rather an outlet to write down my thoughts and maybe entertain or influence some people along the way. Wish me luck and enjoy.